AfroRomance is for anyone who wants to date someone of another race. It has around 97,000 members, many of whom are in the United States, but it accepts members from most countries. It is free to join; but you will need a premium upgrade to lift restrictions on email and online chat. If you're interested in a romance that crosses racial boundaries, AfroRomance is a place to look. To register on AfroRomance, you simply choose a screen name, and answer the questions on the following two forms. It does ask that you supply your real name and your location at the start. Profiles are moderated by customer support. So if you don't put some care into crafting a good quality personal page for yourself, there's a good chance it will get removed. This means you'll have to start again. Photos are recommended but not required - you can add a photo at a later point if you wish. The whole process should take no more than a few minutes. Afroromance is aimed at anyone interested in initiating romantic relationships that transcend racial boundaries. It has a diverse group of ethnicities including Caucasian, Black - African and American, Asian as well as many other races. There is a fair amount of activity - but as the community is only around 97,000 it is still quite a bit smaller than AfroIntroductions. My searches revealed there were typically only 10-20 people online at any given time in my area; but this will depend on your location. Security features let you stay private until you know someone well enough. The features available are fairly standard. There's a search menu which lets you find people by selecting an age rang, and their location - there's also a distance option which lets you filter-out people who're too far away. Searches can be further refined from the tab on the right hand side. This lets you refine your matches by appearance, ethnicity, occupation and religious background. With an open mind, there are infinite romantic possibilities here. This site offers a significant advantage over trying to find romantic partners of other races in bars or at social events. If you attempt to flirt with someone of another race at a bar, there's a possibility that your intentions will be misconstrued. This site is an easy way to navigate the complexities of interactions between different races, and to find romance. Other places offering interracial connections include Afrointroductions and Interracial Match. Rss Feeds. Subscribe to comments for this site. [?] Receive updates about Afroromance.com directly through your newsreader. Am a new member here but have failed to upgrade since I have no credit card and the other day money order seem not to be available in my country and too why is it that I try to flirt but no man shows intreast do they think am a scam hope what ? looking for a man from the United Kingdom who is serious for which the relationship may lead to marriage.no jokers please. I was a PAYING member of this site. The IP Adress associated with my account was deemed fraudulent. So I had to prove I was real. I did so and paid for my next month. Then come to find out they'd message every lady I'd spoke with that my account was a fraud. Now I'm totally burned on their site due to no fault of my own. And to add to it they won't refund my money after being on the site just 2 hours. FYI... 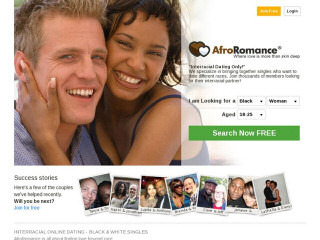 They own several other interracial dating sites so BEWARE! This site needs to come in line with all other dating sites and get an app, via mobile it's extremely glitch and doesn't work well at all, I have suggested this to them in the past and been ignored. I'm sure there are a hand full of decent people on there but there seem to be an awful lot of people on there for a reason i.e. they have big issues. Another thing is that there aren't many members in the UK, possibly they don't advertise for new members enough? The site is pretty good, but The way they list the members is boring. Online dating is brutal, esp for women. There are lots of delusional men on the site. I eventually deleted my account bc I stopped getting notifications of views and messages. I'm pretty busy, if I don't get notifications I will forget to log in. I would log in and have lots of new views and messages. But if you don't message some in time they move on, so I may have missed out on some great guys. When I called customer service they were NEVER available. I guess they don't want my money. I may return in the near future, but I'm meeting guys of other races on non interracial sites just fine. Am a new menber from Uganda about to make a month on the site but since i joined ive been trying to pay and upgrade but it keeps telling me my card number is wrong. what can i do to pay because i want to be able to use the site there is nothing i do since am not a premium member. Single woman looking for a single loving and caring and honest man. I'm a kenyan lady looking for romance and a bit of fun. Are you there? Looking for a good girl to have fun,to love and be with. i wanna try this site out. I've been single for a long time now i can't just keep going on zoosk.com forever. AfroRomance 3.83 19 A review of AfroRomance. AfroRomance is for anyone who wants to date someone of another race. It has around 97,000 members, many of whom are in the United States, but it accepts members from most countries.